BBQ season is in full force here in my neck of the woods. Not only does the warmer weather make me crave summery drinks and cocktails my food cravings have changed as well. Grilled vegetables and meat heavy dishes have definitely taken over the menu. Ranking hight on my lists of favorites these days is this Lemon Garlic BBQ Chicken Recipe! It is summer and naturally in summer my social life seems to pick up pace. It feels like friends come out of the cozy of their homes and more likely than in the winter month I go out for a drink after work or grab a bite with them in the evening. Sitting outside and enjoying the warmth is just so appealing! As a result I am often not prepared for lunch! I think I have mentioned it before but neither me nor Stefan have a cafeteria or canteen at work and so we have to take lunch to work every day. I usually cook 4 servings of all dinners instead of 2 but when you go out for dinner there’s most of the time no leftovers to pack. I am also not a huge fan of meal preps. I can see the advantage of it but filling tupperware with pretty much the same dish and eating this 5 days in a row is just sooooo not appealing to me. To be honest I would be the kind of person to ditch lunch up from Wednesday and eat enourmous snacks that do NOT come from a tupperware. I know it doesn’t have to be that way but that’s the stigma I associate with prepping meals. I guess it’s high time to get over my silly aversion. I may sound like a broken record but my favorite foods and recipes ALWAYS attain to the full range of taste! I am only fully satisfied when my food tastes a little bit of everything: salty, sweet, spicy and a bit sour. This Lemon Garlic BBQ Chicken Recipe perfectly satisfies this need. As a plus it also has this nice hint of smokey BBQ flavor. I am not sure if it can get any better! This dish tastes fresh and spicy and is best when it is juicyly grilled. You can easily make and grill it in bulk and pepare it for a week of different meals. 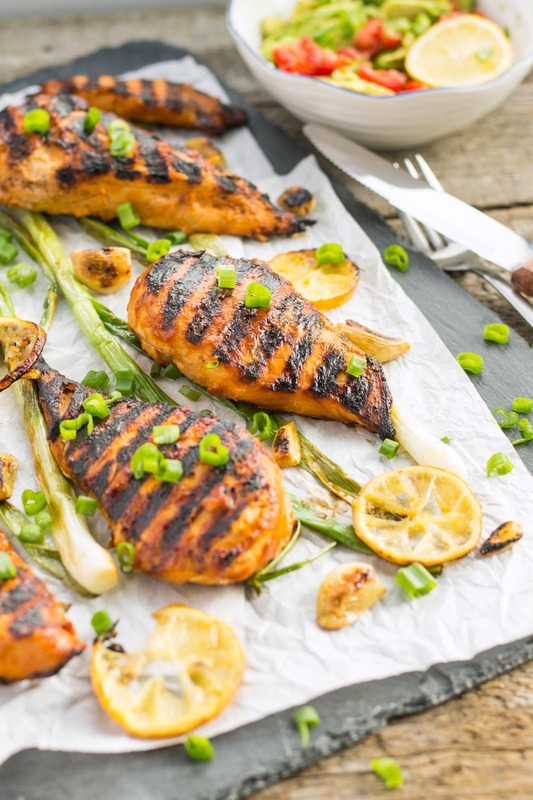 As the Lemon Garlic BBQ Chicken Recipe is so versatile it just doesn’t get boring! It is perfect with a side of vegetables on Monday, on a salad on Tuesday or in a sandwich on Wednesday! Pair it with some raw veggie sticks and a nice dip on Thursday and with a side of roast potatoes on Friday and you are set for the entire week! Meal prep has never been that appealing to me! 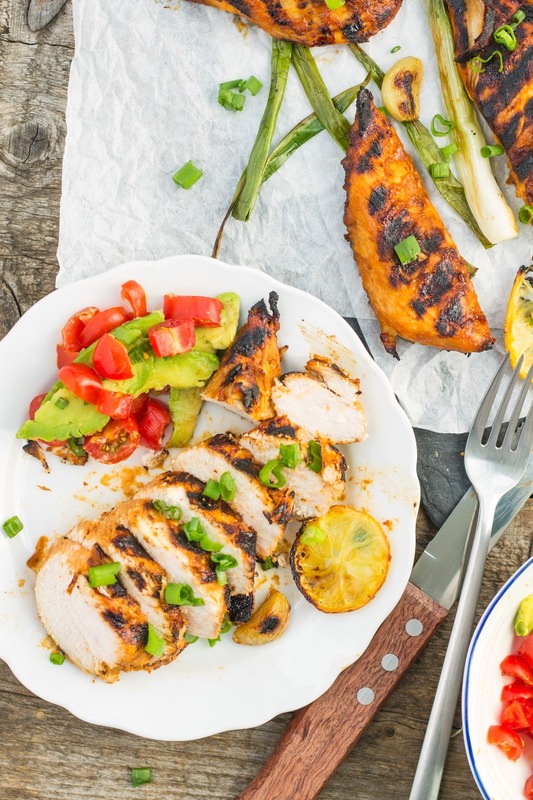 A fresh and spicy recipe for juicy grilled chicken breasts with a hint of smokey BBQ flavor. Perfect with a side of vegetables on a salad or in a sandwich! This recipe is perfect for meal prep. Just double or triple the recipe and grill in bulk. Pair it with a side of raosted veggies, add it to a salad or a sandwich and you're good to go for a week! Dang! Now I took the best excuse for wasting my Sundays away. I guess I have to start firing on the grill and getting my tupperware out. Next week will for sure be a delicious one! Do you prep meals for the week? You’ve made this chicken look so beautiful! Love that make-shift bbq sauce! Oh I like the inclusion of the tomato paste in this marinade – defintiely an awesome combo there! As you know, I meal prep for the week but everything I eat is different – so right now I make kangaroo burgers for lunches but will have them with sweet potatoes, or chopped up in a stir fry etc so that the meals are all different. I think if I had to decide what I wanted to eat every day I would be standing in front of the refrigerator forever! I’m so indecisive! You’re the food prep queen! Oh don’t get me started on being indecisive. Last week I went to the supermarket and hoped to get some inspiration there. I stood in the fruits and vegetable department for 10 minutes and ended up buying a loaf of bread! 1. I cannot eat the same meal for lunch every day either. I have to mix it up. 2. You’re the only person who makes me crave meat. You’ve got a way with pictures my friend. 1. I hear you! I get super bored so easily!